App your school > Miscellaneous > Mobile Opportunities. Published by Polis the media and society think- tank for the Media and Communications Department at the London School of Economics and Political Science, in 2015. The following are aspects of that research, that were interesting for the work of the App Your School project. Mobile Opportunities is based on the findings of EU Kids Online and its sister project Net Children Go Mobile, which interviewed over 33,000 children in Europe between 2010 and 2014 Mobile Opportunities looks at these European children’s experiences of positive engagement with mobile media and how they use their preferred mobile devices and for what, where and when they use the internet. Children are the early adopters of smart technologies, particularly social network services (SNS), apps, video and new mobile devices. How they choose to use them will shape their futures and influence future generations too. How do children negotiate the twists and turns of their own lives set against the tribulations of managing new technologies and the expectations of others? How do they use mobile media to have fun, to play, and to enjoy themselves? How are mobile devices – smartphones and tablets – changing children’s media use and to what extent? How is mobile media contributing to overcoming challenges for education in which schools are slow to keep up with the expectations of their students with regard to digital engagement? What do we think will happen in the future to children’s public and private behaviours? Children and young people are using portable devices in any particular location that a connection can be made finding new ways to be online and in the real world at the same time. Many children believe they are more social since having a smartphone, not least because phones are always to hand and some of the apps they use provide communication free of charge (via WiFi). Having a smartphone is seen as a must for being social, even for some who are as young as 9 or 10. Learning via mobile media is not new but the availability of smartphones and tablets does open many new doors for educational opportunities. At home the mobile is used such as to share homework problem solving, for language translation and to look things up. Limitations to these mobile opportunities are mostly technological and educational: the ability to access and use devices (and power points to charge them), and the children’s digital literacy. Self-directed learning means children are acquiring new mobile skills and becoming more digitally media literate which in turn is an aid to safely gaining future benefits from mobile opportunities. Mobile opportunities for being entertained online are extensive and this has the potential to be quite a problematic area. Children also use their smartphonesand tablets to be entertained such as by listening to music downloads, following the daily vlogs of famous YouTubers, watching television catch-up, downloaded films and podcasts etc. The scope for finding entertainment online is huge and children and young people will encounter many mobile opportunities – some risky ones – in the process. Children are using their mobile phones and online experiences to explore their identity. Taking “selfies” is just one way they find out how others see them and find out what “being me” means. To some extent the mobile phone becomes an extended part of their self, with an emotional attachment reinforced by the role the smartphone plays in their day to day life. Owning your first smartphone or tablet is a significant moment in a child’s life. For many children this becomes the linchpin for their social well-being as they explore and understand their identity. This interaction with their phone on a daily basis results in the device being imbued with emotion and personal content. Developing social relationships, friendships, meeting new people, talking to “good” strangers online are all experiences that the children encounter when using their smartphones and tablets. 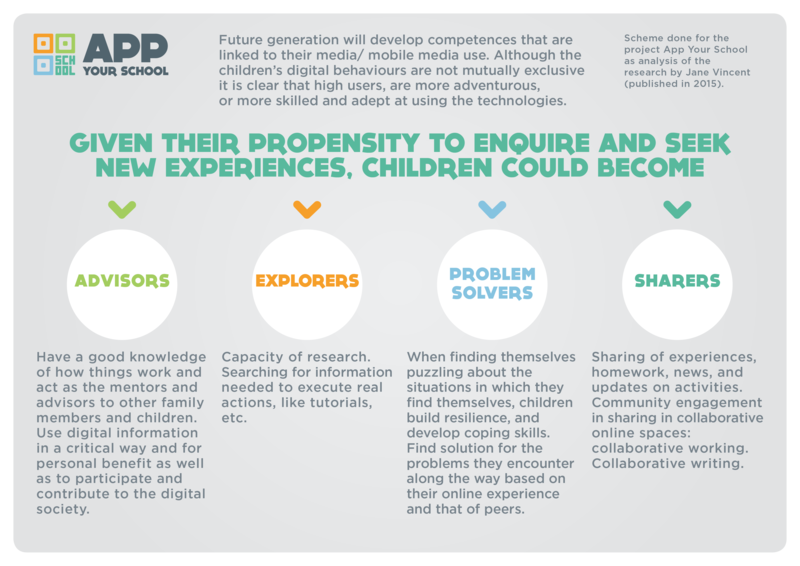 Future generations (some are already true for now) will develop competences that are linked to their media/ mobile media use: Children take on particular roles within their peer groups that are also reflected in the ladder of online opportunities. Although the children’s digital behaviours are not mutually exclusive it is clear that high users, are more adventurous, or more skilled and adept at using the technologies. These are the older and less risk-averse children. Given their propensity to enquire and seek new experiences, these groups of children could be the innovators and leaders for future generations of online users. Children find out how to do things with their smartphones and tablets by asking someone they think knows how to do it. Sometimes it is a parent or carer but most often it will be another child. These advisors have a good knowledge of how things work and act as the mentors and advisors to other family members and children. Children who are explorers should be particularly strong at climbing the ladder of online opportunities and do not really mind too much if they encounter some hazards along the way. It is part of the fun. Children will push the digital boundaries of their devices. Exploring and pushing boundaries is not all about being on the edge of acceptable behaviours. One Italian boy looks at art websites for inspiration for his drawings, and another uses YouTube to look for tutorials to help him learn to play the drums. He says they are more than tutorials, they are proper music classes. But, it is clear that the risk of harm as children explore mobile opportunities can be damaging and finding a way to mitigate this is important if their investigative and enquiring approach is not to be stifled. Some of the intensive online users like to push the limits of their comfort zone and find solutions to the problems they encounter along the way. With social networks in particular, children face daily challenges of determining what is real and what is fake, what is for fun and what is potentially harmful. They make decisions based on what they already know and what their friends know and they reflect positively upon these new experiences. While puzzling about the situations in which they find themselves they build resilience, and develop coping skills. Application of these online skills enables them to grow and develop improved media literacy, as well as in confidence and the more confident they become the more resilient they become. Pushing the limits of online activities is fun and as children mature in online experience and age, their media literacy skills are shaped and improved by their ability to navigate and mitigate potentially harmful encounters. Children as sharers are not only lending or borrowing mobile devices, but also sharing the information they contain such as photos, apps and music. The social networks and apps children use are based on sharing such as photos used in Snapchat or posted on Facebook. Sharing allows the children to have a similar experience and something in common with each other such as via class groups set up on Twitter, Whatsapp or Facebook that allow homework, news, and updates on activities to be communicated to all. The use of Instagram is typical of the phatic communications that pass between children and young people enabling a continual sociability without being explicit about it. Children as sharers and “problem solvers” are exemplary of the online communities that have been growing since the inception of the World Wide Web. As well as their own social groups children participate in the broader online communities to play games such as Minecraft or Call of Duty, to read news media or to search for information such as on Wikipedia. Some of the children have a healthy scepticism about the accuracy of all the content on Wikipedia which shows their engagement in this successful worldwide online community. Some people who participate in Wikipedia take it seriously because they recognise their role in making it work through a sense of obligation and shared expectations. These are values shared by many of the children and young people that we met in our research. Sharing in collaborative online space and being part of civic communities is a positive example of online engagement and one in which many children are already getting involved. EU Kids Online is a thematic network of 33 countries that aims to enhance knowledge of European children’s online opportunities, risks and safety. From 2009- 2011 it conducted a 25-country survey of children and parents across Europe, examining their online activities, skills, risks and safety. It has also developed a European Evidence Database of 1,500+ studies, a Research Toolkit for researchers, and a body of qualitative research to inform and interpret the survey findings. 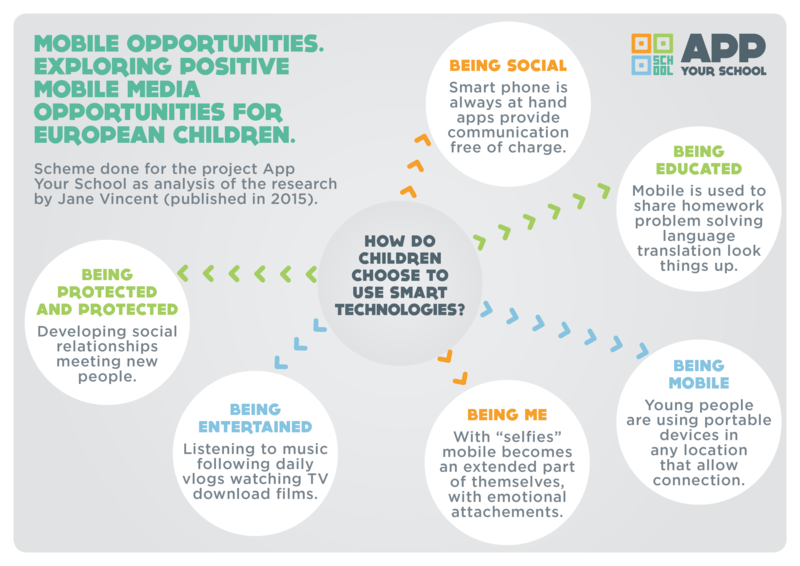 a survey and qualitative research focusing on children’s uses of mobile technologies. The report is based on the two surveys, which conclude, based on the findings are supportive of the ‘usage hypothesis’: the more children use the internet, the more opportunities they take up and the more skills they develop. Smartphone and tablet users use the internet more, both at home and school (as well as in all the locations asked about), are more likely to engage in the activities we measured and claim nearly twice as many skills as children who don’t use mobile devices to go online.” It could be helpful to examine children online practices in the six fields proposed: being mobile; being social; being educated; being entertained, being me, being save and protected. Based on this, interesting is the classification of skills for the future, the development of this skills linked to their online practices – future which is already now (the report is from 2015 and is already aware that this future skills regard the nearest future, aknowledging the advancement of technologies) – these could be a set of skills to assess with the Digital ateliers. Capacity of research – searching for information needed to execute real actions, like tutorials, etc. when finding themselves puzzling about the situations in which they find themselves, children build resilience, and develop coping skills.